At a Philadelphia School DIstrict celebration of school performance and growth, (L-R) City Councilwoman Jannie Blackwell; school board members Julia Danzy, Lee Huang and Maria McColgan; Middle Years Academy Principal Shakae Dupre-Campbell; and Superintendent William R. Hite Jr. recognize MYA's accomplishments. 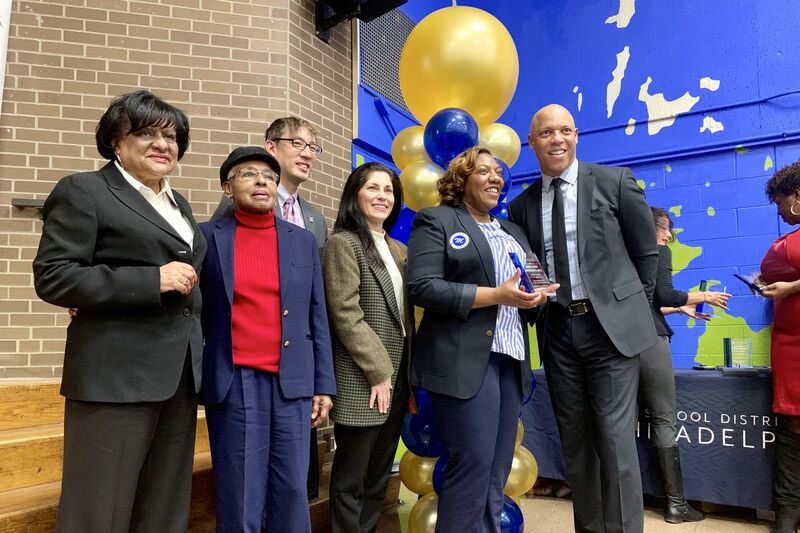 Forty-two Philadelphia schools were hailed as the best and most promising schools of the year at a Wednesday ceremony at Hartranft Elementary in North Philadelphia. The announcement came as the Philadelphia School District released ratings for 316 city schools — traditional public schools and every charter except one. Overall, city schools, district and charter, earned a 42 out of 100, by the district’s internal performance metric; last year, the average was 35. Though that measure could be considered a failing score, Superintendent William R. Hite Jr. noted that city schools have posted four straight years of growth. He spoke after a ceremony that felt like the Oscars for Philadelphia schools, with balloon arches, performances, crystal trophies for winners, and thundering applause. Schools are broken down into four tiers — model, with scores 75-100; reinforce, 50-74; watch, 25-49; and intervene, 0-24. Schools in the intervene category can be placed in the district’s turnaround network, with extra supports and scrutiny, and possible forced staff changes and other major overhauls. Broken down by sector, charter schools generally scored better than traditional district schools in the latest report. District schools scored a 40 and charters a 46, up from 34 and 44 the prior year, respectively. Since the district instituted its 1-to-100 “school performance report” scores in 2014-15, nearly double the number of district and charter schools made its top two performance tiers — up to 68, from 36. But that means the vast majority of city schools — 258 — remain in the lowest two performance tiers, scoring under 50. The number of schools in the lowest quartile, those that scored a 24 or below, has dropped significantly in four years. Only 45 schools now rank in the bottom quarter, nearly half as many as did four years ago. There are 220 traditional public schools and 87 charters in the city. One charter, West Philadelphia Achievement Charter, declined to participate in the rating process. Those district schools cited for strong growth, in the form of either three straight years of increased scores, moving up two tiers in the district’s performance model, or both, were: Lea Elementary (42), Munoz-Marin Elementary (35), Feltonville Arts and Sciences (52); Prince Hall Elementary (33); Bayard Taylor Elementary (26); Howe Elementary (37); Kensington Health Sciences Academy (22); Penn Treaty High School (25 for its middle-school grades); Penn Treaty High School (23 for its high school grades); South Philadelphia High (12); Academy at Palumbo (67); Bryant Elementary (19); Disston Elementary (27); Hartranft Elementary (41); Overbrook Educational Center (64); Vare-Washington Elementary (54); Jackson Elementary (53); Waring Elementary (25); Bregy Elementary (26); Middle Years Alternative (52); Comly Elementary (64); Taggart Elementary (53); Chester Arthur Elementary (46); and Lawton Elementary (32). Charter schools that earned recognition for promising growth included: Franklin Towne Elementary (76); Richard Allen Preparatory Charter School (28), Boys Latin of Philadelphia (51), Philadelphia Performing Arts Charter (65), Esperanza Academy Charter (48); Universal Charter Alcorn (54); Mastery Charter at Cleveland (42); Mastery Charter at Frederick Douglass (34); Keystone Academy Charter (64); First Prep Philadelphia Charter (43); Universal Charter Vare (46); Mastery Charter at Gratz (43); Mastery Charter at Harrity (49) and Philadelphia Charter for Arts and Sciences (48). Mayor Jim Kenney, who has made education a centerpiece of his administration, said the ratings reflected what he heard recently when he met a young professional moving to Philadelphia from another city. The man and his wife had their pick of places to live, but they chose Philadelphia, zeroing in on South Philadelphia because they wanted their child to go to Jackson Elementary. Kenney said that was perhaps the best news he’d heard since he became mayor. A handful of principals from schools that have shown growth said before the ceremony that their success was not magic, but rather hard work — setting high expectations, making students responsible for their progress, going to bat for teachers, and creating a place where kids want to come to school. At Middle Years Alternative in West Philadelphia, where scores have jumped from a 32 to a 71 in three years, principal Shakae Dupre-Campbell has managed to offer students 22 after-school clubs and activities, on top of a host of athletic offerings. That anchors students. The district said school attendance is up, with 46 percent of students attending school 95 percent of the time or more, up eight points from the prior year. And its graduation rate rose again. For the Class of 2018, 69 percent of students graduated from district and alternative schools in four years, up from 67 percent for the Class of 2017. It was the fourth straight year of graduation-rate growth.